This entry was posted in Round-Ups and tagged Tweets on May 31, 2009 by Kelson. 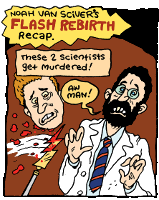 Wizard has a couple of comic-strip recaps of the first two issues of Flash: Rebirth by Ethan Van Sciver’s brother, Noah Van Sciver. TwoMorrows, publishers of The Flash Companion, is having a 50%-off sale on their website. The Flash Companion itself isn’t one of the discounted items, but you can pick up some other Companion volumes (Including Justice League Companion and The Titans Companion vol.2), some Modern Masters books, collections of Alter Ego, Brick Journal, etc. And totally off-topic, SciFi Wire has an article on Why you should watch the final episodes of Pushing Daisies. I really liked this show and was disappointed when ABC canceled it halfway through this season. The final three episodes will be broadcast Saturday nights starting today, and the DVD release is in July. The SciFi Wire article is a good primer on the concept, characters, and appeal of the show. This entry was posted in Round-Ups and tagged CSBG Cool Comics, Grant Morrison, Howard Porter, Justice League, Linkblogging, Noah Van Sciver, Pushing Daisies on May 30, 2009 by Kelson. So why post this cover? Because this is my 500th post on Speed Force! To celebrate, and inspired by Major Spoilers’ Ten Superhero Party Drinks, my wonderful wife came up with a Flash drink — two versions, one alcoholic and one not. Peel zest from entire lemon in one long spiral with vegetable peeler. 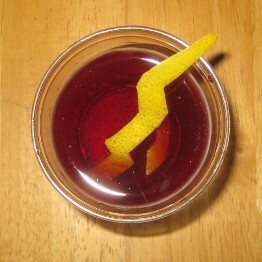 Cut jagged bits into lemon peel to give it a zig-zag or lightning bolt look. Cut lemon peel strip in half crosswise (use one half for each of two drinks). Mix all liquid ingredients cold and pour into glass. Place lemon peel decoratively in glass. Ideally, you should have something else you can use the rest of the lemon for. *Yes, there was a Flash v.2 #0 in between issues #94 and #95, but all DC books that month were numbered #0, so it doesn’t figure into the sequence any more than annuals do. This entry was posted in Fun, Site News and tagged Anniversary, Covers, Drinks, Food, Numbering on May 28, 2009 by Kelson. 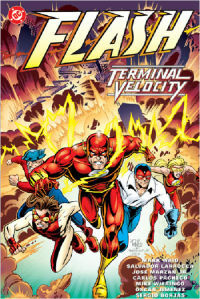 Comics Should Be Good highlights more Cool Comic Book Moments from Mark Waid’s Flash story, Terminal Velocity. They’ve got two items from Flash #99: Wally’s sacrifice and Bart stepping up (which doesn’t go quite as well as he expects) — and one of two moments from Flash #100: Wally’s…return? One more coming up tomorrow. Update: the conclusion is up! Comics in Crisis thinks that now is a perfect time for new readers to jump into the Flash. iFanboy compares comic book coloring techniques from the 1980s and today, using pages from Secret Wars and The Flash: Rebirth as examples. Lying in the Gutters, in its final column, cites conflicting rumors on the future of Justice League of America, with either a Grant Morrison/Jim Lee team-up or Geoff Johns. Earlier rumors had Geoff Johns and Jim Lee. When Worlds Collide has put together a list of the Best and Worst of Grant Morrison, with a Top 10 and Bottom 5. I’ve only read about 1/3 of the combined list. Update: Comics Should Be Good fires back with another Top 10 Grant Morrison list. Also interesting: my Google Alert for “flash comics” came up with this list of things about the (American) comic book industry that should be common knowledge, but aren’t. This entry was posted in Round-Ups and tagged Art, CSBG Cool Comics, Flash: Rebirth, Grant Morrison, Justice League, Linkblogging, Mark Waid, Terminal Velocity, Wally West on May 28, 2009 by Kelson. Heritage Auctions reported today that a copy of Showcase #4 graded at CGC NM+ 9.6 sold for almost $180,000 at auction, making it “the single most-expensive Silver Age book in history.” In an earlier post, Heritage Auctions stated that this was the best-preserved copy of the issue known. At the time the book was published, superheroes — and comics in general — had fallen out of favor. 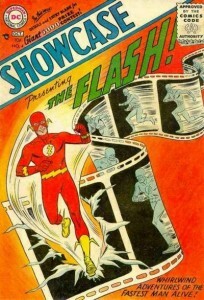 Showcase #4 introduced the world to a revamped Flash. Jay Garrick and his Mercury-inspired costume were gone, replaced by the more modern Barry Allen. 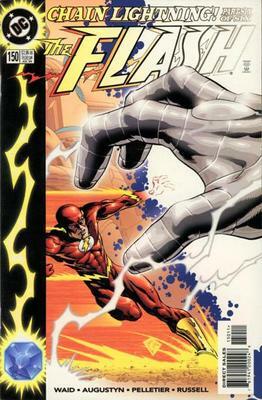 The success of the Flash led to an ongoing series, as well as space-age reboots of Green Lantern, the Atom, Hawkman and others, ushering in a new superhero boom. This entry was posted in Flash History and tagged Auctions, Barry Allen, Silver Age on May 27, 2009 by Kelson. Another interview with Geoff Johns, this time at Scripps News. The stuff I really want to focus on is with Barry Allen as a crime-solver. But his crimes are on the crazy ’60s-physics level. A murder could span across dimensions or ancient cities or crazy places that are real cities. Or he could find a body where the crime is unsolvable through normal means, and kinda taking that “CSI” approach but putting it on a greater scale of wonder and scope and the DC Universe itself….He solves crimes that are unbelievably bizarre and unexplainable. And they take him to different places and strange foes and bizarre criminals. The interviewer compares it to CSI: 52. This sounds like the kind of book I’d be interested in even without the Flash. And when Geoff Johns eventually leaves, Grant Morrison would be the perfect choice to follow him — I like the way he wrote Barry in Final Crisis, and he showed in his 9-issue run back in the 1990s (reprinted in The Flash: Emergency Stop and next month’s Flash: The Human Race) that he can write crazy sci-fi adventure starring the Flash. This entry was posted in Flash News and tagged Barry Allen, Geoff Johns on May 27, 2009 by Kelson.